First the rumors about Louis/Eleanor getting engaged, and now there are rumors about Liam/Danielle! According to a few pics I found at Tumblr, it looks like Liam Payne proposed to his dancer girlfriend Danielle Peazer. The picture of them holding hands are from his Instagram (the account hasn’t been confirmed his so it can be fake). I tried to go on his twitter account to find the ‘tweet’ but I couldn’t find it (he might of deleted the tweet though). I looked around to see what other people thought about this news, and clearly more people think this engagement was more real then the Louis/Eleanor engagement. But there were a few people who had their doubts.. 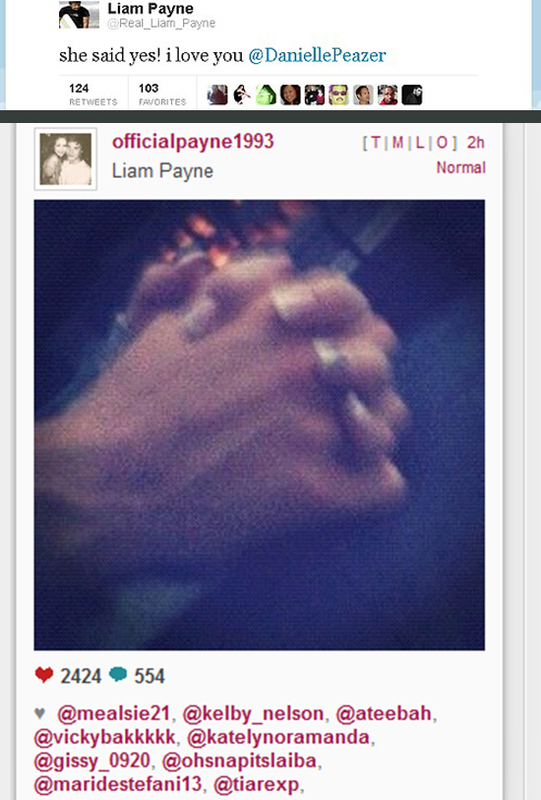 This entry was posted in one direction, Uncategorized and tagged Did Liam Payne propose to girlfriend Danielle Peazer?. Bookmark the permalink. I get his tweets sent to my phone and he never tweeted that! I don’t think this is real.